Van Kruiningen H J, Wojan L D, Stake P E, et al. The influenec of diet and feeding frequency on gastric function in the dog. JAAHA 1987; 23 :145-153. Burrows C, Bright R, Spencer C, Influence of dietary composition on canine gastric emptying and motiltiy-Potential role in acute gas-tric dilatation. AJVR 1985; 46; 2609-2612. 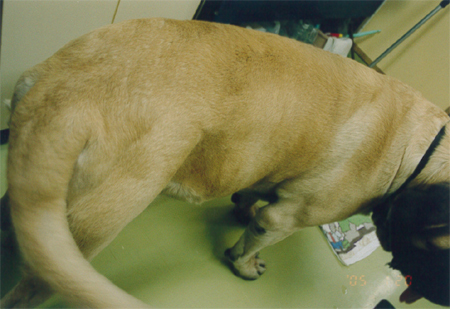 R, E, Thomas Gastric dilatation in small dogs in J Small Anim Pract, 23(May 1982):271. Stein F J, Louis D H, Stock G G and Sis R F: Acute gastric dilatation in common marmosets. Lab. An. Sci. 31; 522-523, 1981. Bennett B T, Cuasay L, Welsh T J, Beluhan F Z and Scofield L: Acute gasteic dilatation in monkeys: A microbiologic study of gastric contents, blood and feed. Lab. An. Sci. 30; 241-244, 1980. Landory S M, Vav Kruiningen H J, Food hadits of feral carnivores. A review of stomach content analysis. JAAHA 1979; 15; 775-82. Rogolsky B, Van Kruiningen H J, Short chain fatty acids and dacterial fermentation in the normal canine stomach and in acute gastric dilaatation. JAAHA 1978; 14;504-15. Caywood D, Teague H D, Jackson D A, et al. Gastric gas analysis in the canine gastric dilatation -volvulus sydrome. JAAHA 1977; 13;459-462. Warner N S, Van Kruiningen H J, The incidence of clostridia in the canine stomach and its relationship to acute gastric dilatation JAAHA 1978; 14;618-23. Van Kruiningen H J, Gregoire K, Meuten D J, Acute gastric dilatation: a review of comparative aspects, by species, and a study in dogs and monkeys. JAAHA 1974; 10;294-324. Andrews, A.H.: A Study of Ten Cases of Gastric Torsion in the Bloodhound. Vet. Rec., 86:689-693, 1970. Richards E A, Steggerda F R, and Murata A, Relationship of bean substrates and certain lntestinal bacteria to gas production in the dog. gastroenterology, 55:502-509. 1968. Woods C A, & Dalby M, Ibid. 72. 1133. 1960. Tutt J B, & Tarrow T G, Ibid. 72. 1014. 1960. Turner T, Vet. Rec. 76. 243. 1964. Stunzi H, Teuscher E, & Scheitlin M, Schweizer Arch. Tierheilk. 97. 312. 1955. Steele, C, Vet. Rec. 47. 1063. 1960. Sprrell B, Mod. Vet. Prac. 41. (13) 48. 1960. Nieberle K, & Cohrs P, "Lehrbuch der Speziellen Pathologischen Anatomie der Haustiere, Jena, Gustav Fischer. 1931. Muller G, & Gloss A, "Diseases of the dog Chicago, Alexander Eger. 1937. McCunn J, "Hodbay's Sugrgical Diseases of the dog and cat, London, Balliere, Tindall and Cox. Mcbride N L, in Canine medicine, American Veterinary Publications Inc U.S.A. 1953. Jones E W, Cornell Vet. 42. 188. 1952. Hutyra F, Marek J, & Manninger R, Special Animals, London, Balliere, Tindall and Cox. 1938. Fanquist B, J. small Anim. Prac. 10. 507. 1969. &Garmer L, Idib. 8. 523. 1967. Blackburn P J, & McFarlane D, J. Comp. and Ther. 54. 189. 1944. Cadeac C, J. Med. Vet. Zoo-techn. 57. 1. 1906. Encyclopedie Cadeac, Pathologie Interne, Pharynx Estomac Paris J. B. Bailliere et Fils. 1908.